Our first ever Swedish guests just left La Maison des Deux Clochers and are already planning their return trip! “I think that everyone is hoping to find “that place” where you just want to sit on the stairs and don’t want to leave. 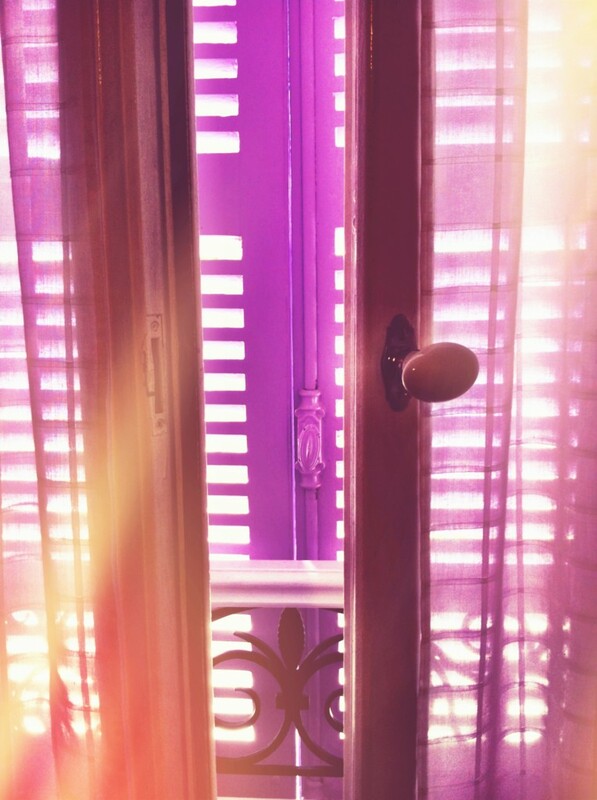 Now I’ve found that place and I know that me and my family are going to return to this lovely place with the lilac shutters. This quiet and peaceful little village is situated in the middle of the wineyards. It doesn’t even has a bakery, only winemakers, very good one’s. Every morning we walked with a smile through the beautiful landscape to the next village to buy bread and said “Bon jour” to everyone we met. There was also a little cat next door who visited us every day. My son and I love cats. This house and this village is such a wonderful place to stay. Hopefully we’ll return already this autumn. This entry was posted in Guest Reviews, La Maison des Deux Clochers, Les Maisons on August 13, 2012 by admin. “That’s not negotiable,” I said, waving my hand towards the empty space where the Notary’s car had been parked. “Especially given the circumstances of the last few minutes.” It was a desperate tactic, but it was perhaps our only hope of preventing the property from being sold out from underneath us. I grabbed Franck’s hand. Did he feel as bewildered and angry as I did? Could this really be happening? Was the Maitre, who was supposed to be our savior, now trying to cheat us out of this property? The scale of the betrayal – if that is indeed what had just happened – was almost too enormous to comprehend. If we didn’t get this property because of Maitre Ange I was certain I would be catapulted back to the way I had felt when we first arrived back in France. I couldn’t bear the thought. “Je ne crois pas! He’s on his cell phone,” Franck hissed. We were around the back of the car in time to see the realtor gabbling into his cell phone and making frantic gestures with his hands. He face was the colour of a ripe aubergine. He caught sight of us and hung up without even saying good-bye. “The paperwork?” I reminded him. “Turns out I had it in my bag after all. Sorry, phone call with a client,” he lied. Franck read the papers over line by line while the realtor sighed, then passed them to me. The metal of the car underneath my hip burned, but I took my time. One of the few useful things I had learned over the tortuous last two years was to never skim over a contract. “You’ve written nothing here about there being a 24 hour limit on the offer,” I said when I had scrutinized the last word. “We are,” Franck and I said in unison. I passed the paperwork back. The realtor scrawled in the twenty four hour clause and then passed us the pen. I couldn’t believe we were rushing this way to make an offer. We didn’t even know if we would qualify for a mortgage. But if that ache in my gut was right about Le Maitre’s perfidy, we had no choice if we wanted our dream property. This place was the path to finding myself…ourselves again; it could not be sold to someone else. I felt exactly the same way about getting this house as I did about finishing my law degree at Oxford. When I walked out of the examination schools after my final exam I was fully expecting that in that very moment, everything would click. Struggle and the anxiety would be a thing of the past. Franck was there waiting for me as I came down those stairs for the final time, as well as my friends Emmy and Melanie. They were armed with the traditional confetti and champagne and red carnations. I kept waiting for the click – anticpating a feeling that never came. Elation was all around me, but I didn’t feel it within me. Why hadn’t it happened? Now I understood. It wasn’t my law degree that would make everything perfect – it was this house. Owning this house would change everything. “You are going to call the sellers, right away, n’est-ce pas?” Franck’s eyes blazed at the realtor. The realtor grimaced, shook our hands in a perfunctory good-bye, and drove off. I watched his shadow through the rear windshield. He picked up his phone and was holding it to his ear before he rounded the first corner. This entry was posted in La Maison des Deux Clochers, Les Maisons, The Grape Years - Excerpts from the book on July 13, 2012 by admin. This week, push comes to shove with the nasty notary. “Oui.” Franck narrowed his eyes at the scheming on the other side of the fence. “For the asking price,” I said. It wasn’t really a question. Franck nodded. Le Maitre leaned down and began to whisper into the agent’s ear while moving him even farther away from us. “Tout de suite,” Franck added. We moved quickly to break up the worrisome tête à tête. My fingers balled into fists. Franck cleared his throat. The agent jumped. “We are ready to make an offer,” Franck informed him. The agent’s face was bright red and, in stark contrast to Le Maitre’s belligerent countenance, sporting a sheepish expression. “It will also have a time limit of twenty-four hours,’ I added with an arch look at Le Maitre. I wasn’t sure why that stipulation had popped into my head, but there was no time to ponder that now. I gave an imperious nod. He sped off in a cloud of dust. The realtor let out a sound of disbelief at the perfidy of his newest accomplice. “What were the two of your plotting?” Franck demanded. This entry was posted in La Maison des Deux Clochers, Les Maisons, The Grape Years - Excerpts from the book on July 4, 2012 by admin. Laura and Franck’s notary finally shows his true colours…could their mistake cost them their dream house in France? “Do you mind if we confer in private for a moment with our notary?” Franck asked the realtor, who nodded obsequiously and remembered a pressing need to fetch something from his car. Franck and I were nothing if not novices, but this wasn’t what I wanted to hear. I felt an old, almost forgotten, tenacity stirring. Le Maitre’s eyes turned on me with such a patent look of dislike that I took a step backwards. French professionals such as notaries and doctors were not fans of having their revered judgment questioned. Still, I knew what I had just said wasn’t ridiculous. We were beginners but we weren’t idiots. I watched, my stomach sinking, as Le Maitre struggled to replace his expression of disgust with one of mere exasperation. There was someone completely different behind that shiny façade – someone that wouldn’t be inspecting the property for us out of the goodness of his heart. “I’ll have to speak to the agent about that,” he said. “You know, find out about the zoning in this village and so forth.” He made his way quickly over to the agent, who was still rummaging around the bowels of his car. Le Maitre slung his arm around him and pivoted the agent so they moved away from us, towards the washing house. “What’s he doing?” I hissed to Franck. This entry was posted in La Maison des Deux Clochers, Les Maisons, The Grape Years - Excerpts from the book on June 22, 2012 by admin. This week’s excerpt has the heaven-sent notary inspecting the Marey property for Laura and Franck. The man seems like an angel, but is he really a Judas? The next day, Franck and I found ourselves scuttling back to our hiding spot under the washhouse in Marey. We peered through the round window for a glimpse of either Maitre Ange or the realtor. This time I didn’t roll my eyes or complain. I couldn’t bear the thought of anyone interfering with us buying the property. In bed that morning Franck and I had already decided that if we saw signs that our Maitre Ange approved of the place we would make an offer on the spot to the realtor. I pressed my hot forehead against the cool stone. It was all happening so fast. Soon Maitre Ange arrived in a majestic silver Mercedes that somehow seemed to repel the dust that billowed up from the dry country road. I checked my watch – he was actually on time – inconceivable for a French Notary. “Oui,” Franck said. “The two houses you see here and the two granges further down the hill as well as all the land – it goes all the way down to the vineyards. The Maitre merely raised his eyebrows and began to walk towards the gate. He unwound the knot of chain, opened it up, and walked right in as though he owned the place. “I seem to remember you mentioning that the owners had already moved out.” Le Maitre smiled at us winningly. “They have,” Franck said. “Still…I’m not sure if we have the right-“. Franck’s eyes questioned me and I shrugged. I had argued pretty much the same thing when we first visited the property. Still, it felt more like trespassing when it wasn’t my idea. The Maitre Ange didn’t wait around for us to agree or disagree. He strode into the yard as if he owned it, his shining head of silver hair tilted up so he could take in the vast expanse of stone and roof. Franck and I both waited for a sign from him, what did he think of the place? Nothing seemed to escape his scrutiny. He himself , however, remained inscrutable. A shrill honk came from behind us. Franck and I whipped around, guiltily. Le Maitre turned slowly, majestically, with one eyebrow cocked to detect the identity of the culprit who dared interrupt his inspection. The agent lurched out of his dusty car, shedding stray pieces of paper and expostulating excuses all the way across the lawn to where we stood. Franck made the introductions. The real estate agent, taking in the gleaming personage of our Notary, was struck speechless. Le Maitre rubbed his fingers distastefully after shaking hands with the realtor. The realtor blushed, apologetic rather than offended. “I take it you don’t sell a lot of properties around here?” Maitre Ange demanded. Trembling, the realtor led us over to the low house first. Even though I was keeping my eye trained on Maitre Ange, I couldn’t help noticing things that I hadn’t noticed before; the huge keyhole in the thick wooden door that led into the kitchen, the marvelous, heavy key to unlock it hanging on the wall by the stove, the smoothness of the wooden banister in the tall house that ran under my palm like silk…and then there was the wild purple clematis growing up towards my little garret up in the far outbuilding. Each new and perfect detail drove home an undeniable fact – my future happiness depended on owning this place. Maitre Ange remained silent during the entire tour, much to our frustration as well as that of the realtor who became more obsequious and nervous with every minute. Surely Maitre Ange didn’t disapprove, I told myself. How could he possibly object to such a marvelous property at such a bargain price? This entry was posted in La Maison des Deux Clochers, Les Maisons, The Grape Years - Excerpts from the book on June 13, 2012 by admin. The hunt is on for an honest, non-alcoholic notary to help decide if the Marey house is a steal or a money pit. If you want to catch up you can go back to the first excerpt. There were almost as many notaries in Beaune as there were winemakers I realized as I flipped through the yellow pages. We hopped into André’s little red car, drove down through the vineyards, past the medieval walls surrounding Beaune, and found a parking spot in the shadow of the Nôtre- Dame church. We emerged from the car and began to wander towards the rue Paradis towards the Place du Marché. Before we could take more than ten steps we spotted a shiny gold notary seal hanging outside a pair of sleek looking glass doors. “Look at that!” I said to Franck, who looked as thunderstruck as I felt. A Notary’s office, and a lovely looking one, right here beside where we had parked our car? I had walked around Nôtre-Dame hundreds of times and I had never noticed it before. It was like this notary office had materialized out of the ether just for us. Franck and I hurried over to read the fine print under the golden plaque. Notaires Associés – Maitre Ange et Maitre Dupont. “Maitre Ange? Maitre Angel? You’ve got to be kidding me,” I muttered to the sky after a few moments of stunned silence. Franck took a step towards the door. It slid open to allow us to enter. The inner sanctum was just as perfect as the outside. At the reception desk sat an impeccably turned out secretary with a gravity-defying chignon. Franck, who had that French gift for charming secretaries, went up to her and explained our dilemma in regards to the property. We knew we loved it and we wanted to put an offer on it, but we really felt we needed someone like a notary to assure us we weren’t making a gigantic mistake. Franck and I exchanged glances. The waiting room – this was surely the place where the fairy tale ended. At Maitre Lefabre’s every visit necessitated a tortuous wait in the purgatory of his stuffy waiting room filled with sticky, ripped plastic chairs and dog-eared issues of Paris Match from the 1980s. The waits seemed to be meticulously timed to test human endurance. Maitre Lefabre’s clients were always called in to the inner sanctum of his office just milli-seconds before they were about to give up and leave, not a minute before. We edged our way towards the sleek chairs and glossy magazines that sat opposite the reception but before we could even sit down a door to the left of the secretary opened. A man with a head of silver hair and a sharply cut suit ushered us in, shaking our hands warmly and introducing himself as the Maitre Ange. Franck quickly gathered his wits about him and after we had sat down outlined the problem admirably to Maitre Ange. 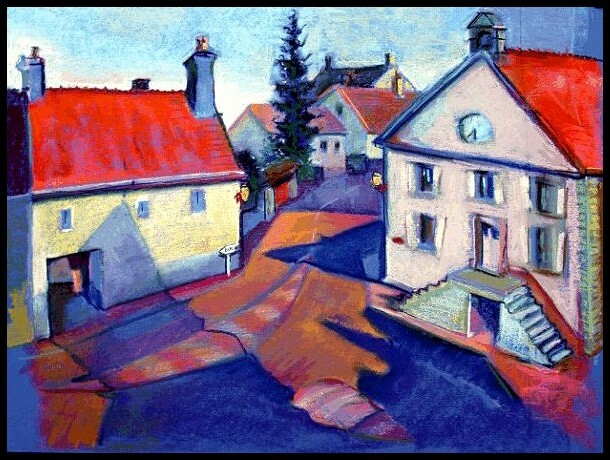 “And what, may I ask, is the selling price?” Le Maitre asked after Franck had given a full description of the property. Franck and I exchanged a worried glance. Was this the moment of truth when the Maitre would snort and say we had just escaped being horrifically ripped off, or that we were idiots not to have bought it for that price already? “Two hundred and fifty thousand francs,” Franck answered. I watched Le Maitre, but his composed face revealed nothing. He merely rolled his Mont Blanc between his thumb and his forefinger. Franck winked at me. This is exactly what we had wanted to happen. “How would you like to be… ah…remunerated…for your time?” Franck asked delicately. Fifteen minutes later the viewing had been set up and we floated out of the Notary’s office, feeling divinely protected now that we had the Angel Maitre on our team. If only life unfolded like this all the time, faith would be a snap. This entry was posted in La Maison des Deux Clochers, Les Maisons, The Grape Years - Excerpts from the book on June 6, 2012 by admin. This new chapter picks up after we return from the house tour in Magny and realize that although we love the property, we have no idea what we are doing. If you haven’t read from the beginning, just scroll back and read from the first exept onwards. I was sitting on one of the chairs at the table outside, holding a wad of vinegar soaked cotton against my foot under Mémé’s eagle-eyed supervision. The wasp sting had not only made my foot swell up and itch like the diable, but it had split my brain in two. On one hand I was desperate to cling to the belief that the Marey property was our destiny and that any problems would magically work themselves out with the assistance of Franck’s guardian angels and the Virgin Mary. Each throb of my foot, though, reminded me of all the things Franck had pointed out to the realtor – the warped roof, the grotty wallpaper, not to mention the need to rewire the entire house. The money we had to put as a deposit on the house was finite. Neither Franck nor I had a job or really any prospects of one. Franck, on the other hand, had no problem believing in only the good omens and discarding the bad. He had already moved us to Marey in his mind. I longed to be swept away with Franck and his plans but the burning reminder of my foot tethered me to the ground. Franck went pale at this, as I suspected he would. When Franck was just a small boy his grandfather had found some Roman coins while tilling his vineyards. He gave them to Franck on the condition that Franck was sworn to secrecy. Finding Roman artifacts or ruins was a real problem in Burgundy. If it got out the government and the archeologists would get involved and the upshot would be the expropriation of land, a thing to be avoided at all costs. We spent the next few hours searching for property inspections companies in the pages jaunes, only to find that like so many surprising things such as peanut butter and money orders and until recently, dental floss, they simply did not seem to exist in France. Notaries were as essential to life in rural France as country doctors like Le Père Durand. Each family seemed to inherit one from their ancestors and the family notary basically possessed a huge file (or files) of paperwork pertaining to their lives; birth certificates, marriage certificates, the buying and selling of vineyards and houses…The files of some Burgundian families spanned back to the 1600s. My first and only exposure to Franck’s family’s notary – the incompetent Maitre Lefabre – was not felicitous. He was a notorious drinker who cared far more for a good Gevrey-Chambertin than doing legal work. The previous summer he had been responsible for filling out all the forms for our marriage and he had forgotten to get us to fill out several essential ones. The secretary from Villers-la-Faye’s mayor’s office called us a week after the ceremony to inform us that despite the copious amounts of wine and champagne that had been consumed, as well as that epic pièce montée that had been gobbled up, as far as the French government was concerned, we weren’t officially married yet. “I’ll call Maitre LeFabre’s office.” Franck stood up. Franck shrugged as though this was hardly damning enough to justify going elsewhere. Franck fiddled with a stray tendril from the wisteria, troubled now. “No,” he admitted, finally. “We need to find someone a bit more anonymous,” I pressed my point. “There must be several notaries in Beaune.” I hopped up to retrieve the page jaunes from the house before Franck could change his mind. This entry was posted in La Maison des Deux Clochers, Les Maisons, The Grape Years - Excerpts from the book on May 30, 2012 by admin. Nadia Craig from Montreal just sent us a great review for her recent stay at our 18th Century village house La Maison des Deux Clochers. Merci Beaucoup et à bientôt Nadia, Ben & Josephine! We absolutely loved our stay at La Maison des Deux Clochers. What a beautiful home you have created. We had everything we needed in the fully stocked kitchen, and slept incredibly well in your comfortable bed. The baby cot was so cute and comfy and our daughter slept well too. The binders of information were invaluable in helping us find restaurants, activities, grocery stores and, of course, winemakers! The welcome bottle of wine was the perfect end to a long day on the road to get to your house from Brussels, on a very rainy drive. It was also one of our favourites, though sadly we didn’t make it to Naudin-Ferrand because of poor planning on our part, and weekend and a national holiday getting in the way! We loved the location, nestled in the vineyards. Tiny Magny-les-Villers is a great jumping off point for everything in the region. We spent lots of time in Beaune, sometimes eating dinner there, other times coming home to cook the goodies we’d picked up at the market or one of the fabulous grocery stores (we loved E. Leclerc and Grand Frais). We were lucky enough to stumble upon the wine festival in Savigny les Beaune, and spent the afternoon wandering around that beautiful town, tasting many a delicious wine, including some fabulous cremant! Some other highlights – Patriarche wine tasting was lots of fun, so neat to see their cellars; vespers service at l’Abbaye de Citeaux was a good rainy day activity, Chateau Rochepot was a beautiful spot; and of course, the Hospice de Beaune is a must see. Our week was not enough to scratch the surface of all the wonderful activities. We will hopefully be back again one day soon for more! This entry was posted in Guest Reviews, La Maison des Deux Clochers, Les Maisons on May 28, 2012 by admin. I’m a day late in posting this, so I posted a much longer excerpt than usual today. This picks up as Franck convinces me to join him up in the idyllic hideaway on the top floor of one of the barns while touring the property for sale in Marey, despite the realtor’s protests that we are going to fall through the ceiling! This was perhaps the only chance for Franck and I to whisper our opinions to each other away from the realtor. My head poked out just over the level of the wooden beams and Franck, beaming, grabbed my hand and pulled me up beside him. I fingered an ivy leaf from the vine that perfectly framed the view. “I can’t believe how perfect it is,” I said, mesmerized. I could become someone else here – someone who didn’t struggle on a daily basis with black thoughts and fear – I felt that in every cell of my body. Still…how could we possibly make it work? How was I supposed to live here and also finish my masters at Oxford then establish a legal career in London? But still, this place was perfect. Everything about buying the property seemed so easy and self-evident, like it was meant to be. Even if I was miserable practicing law, how could anything go truly badly when I owned a place such a magical place as this? A wave of need almost knocked me off my feet. This sacred little spot represented everything that I yearned for – safety, protection, belonging…even a bit of immortality – all of those butterflies I had never managed to pin down in my life. I felt all of my zen-like faith pop like a soap bubble. My bones ached with desperation to make this place my own. Franck must have sensed the sudden urgency in my mood because he squeezed my shoulder and tilted his head towards the real estate agent pacing the grange floor below us. I nodded. It would be difficult, but I knew it was essential. We made our way back down the ladder and Franck lost no time in telling the realtor that indeed most of the floorboards had been rotten up there. “Termites, sans doute,” Franck concluded off-handedly. We made our way back towards the gate as Franck enumerated the herculean amount of repairs required, the epic number of hours it would take every week to mow the very substantial hunk of land, and the constant danger of children falling down the very charming old stone well that Franck laid his hand on as he pulled to a stop. I hadn’t noticed any of these things before, but I couldn’t deny that they were all true. My palm itched to slap Franck. He was ruining the spell the property had cast over me, even if it was merely to put the realtor off our scent. This house was destined for us, damn the roof and the rot and the backbreaking lawnmowing. As Franck gave the well a final, dismissive pat I felt a piercing pain under my baby toe. The pain hop-scotched down the sole of my foot. Jab. Jab. Jab. I dropped to the grass and clawed off my left sandal. A half-squished wasp fell out onto the grass. I gave an explosive and impressive demonstration of my command of French swear words. The realtor stared down at me, both confused and impressed. It had been years since I’d been stung and I’d forgotten how much it hurt. Not just the pain, but the burning and the itching that made me want to tear off my foot. “C’est quoi?” Franck leaned over me. “Un gep,” I swore one last time and then took Franck’s proffered arm and hobbled back to our car. I noticed twitching curtains at the three houses across the street. So Franck hadn’t been completely wrong about the spying villagers. By the time I collapsed in the scorching leather car seat my foot was beginning to swell. What could this mean? Franck’s guardian angels were sending distinctly mixed signals. The perfect house, a feeling of nearly captured peace, then multiple wasp stings. That was the problem with believing in signs; if I believed in the good signs from the heavens, I felt honour bound to believe the bad signs too. Only Franck could have such exasperating guardian angels. Mémé made me press a vinegar compress against my foot for a good hour after getting back to Franck’s parents’ house. The pain subsided gradually, leaving the more painful contemplation of what such an omen – and it would take more imagination than I possessed to believe it a good one – meant for Franck and I. This is an excerpt from my first book project about our adventures buying, renovating, and renting out our four homes in Burgundy. I’m currently searching for a publisher and / or agent, so if anyone knows of anyone who would be a good fit s.v.p. send them vers moi! This entry was posted in La Maison des Deux Clochers, Les Maisons, The Grape Years - Excerpts from the book on May 24, 2012 by admin. 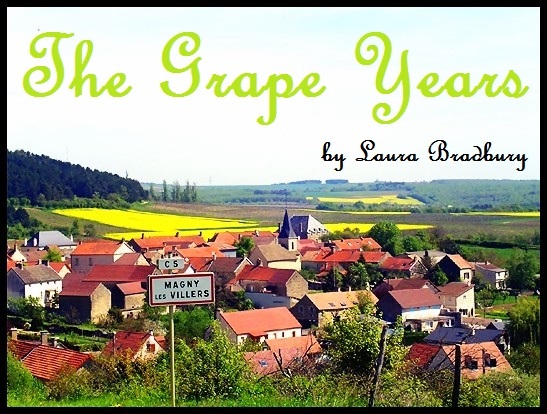 This excerpt of “The Grape Years – La Maison des Deux Clochers” picks up as Franck and I tour the magnificent (and dirt cheap) property we have found in Marey-les-Fussey. The second house was built vertically, whereas the first one was slung horizontally alongside the main road through the village. This one was much newer, according to the Châlonais realtor; it was built a mere two centuries ago instead of four. Each of the four floors had one or two rooms, and they were connected by a graceful wooden staircase that spiraled up the middle of the structure and which became steeper and steeper the higher we climbed. The final room – a bedroom under the eaves – took up the entire top floor. It was a perfect spot to come and escape from the world …once the dead flies were cleaned up, that was. Right now the carpet and the windowsill were dotted with them. Once the house tour was done, the realtor took us down the hill to show us through the first of two massive stone outbuildings which had been used as barns for the past few hundred years. Amongst the other treasures inside we discovered a rusting mobilette, an old wooden cart that was missing two wheels and four giant glass bon bons used for distilling poire william and other hard alcohols. “These granges can also be renovated and made into other houses,” the realtor said, caressing the wall. It was true, the rough stone and massive oak beams provided an amazing canvas. The farthest grange commanded a view of the entire valley – yellow wheat fields giving way to vineyards and then back up to fields again, topped off by a ridge of green trees. Inside, a rickety wooden ladder was propped up against a wooden overhang. Franck squinted up its length and then swung his leg over and began to shimmy up. Franck had already disappeared above us. “Laura, come up here!” Franck shouted down a few seconds later. “What if I fall through the floorboards?” I called up to Franck. I put my foot on the first rung and began to gingerly make my way up, ignoring the realtor’s look of consternation. How much scarier could this really be than climbing the stairs of Oxford’s Examination Schools before my first final exam? Whatever waited for me up top, it couldn’t be as bad as the vertiginous terror I had felt then. A small hope flickered inside me that this splintering old ladder was there to lead me to a completely different kind of place – a place where I could become the kind of person who never needed to feel that way again. This entry was posted in La Maison des Deux Clochers, Les Maisons, The Grape Years - Excerpts from the book on May 16, 2012 by admin.